A NASA conception of the collision using computer-generated imagery. Based on data from the Hubble Space Telescope, the Milky Way Galaxy (pictured right-centre) and Andromeda Galaxy (left-centre) are predicted to distort each other with tidal pull in 3.75 billion years, as shown in this illustration. The Andromeda Galaxy is approaching the Milky Way at about 110 kilometres per second (68 mi/s) as indicated by blueshift. However, the lateral velocity is very difficult to measure with a precision to draw reasonable conclusions: a lateral speed of only 7.7 km/s would mean that the Andromeda Galaxy is moving toward a point 177,800 light-years to the side of the Milky Way ((7.7 km/s) / (110 km/s) × (2,540,000 ly)), and such a speed over an eight-year timeframe amounts to only 1/3,000th of a Hubble Space Telescope pixel (Hubble's resolution≈0.05 arcsec: (7.7 km/s)/(300,000 km/s)×(8 y)/(2,540,000 ly)×180°/π×3600 = 0.000017 arcsec). Until 2012, it was not known whether the possible collision was definitely going to happen or not. In 2012, researchers concluded that the collision is sure using Hubble to track the motion of stars in Andromeda between 2002 and 2010 with sub-pixel accuracy. Andromeda's tangential or sideways velocity with respect to the Milky Way was found to be much smaller than the speed of approach and therefore it is expected that it will directly collide with the Milky Way in around four billion years. Such collisions are relatively common, considering galaxies' long lifespans. Andromeda, for example, is believed to have collided with at least one other galaxy in the past, and several dwarf galaxies such as Sgr dSph are currently colliding with the Milky Way and being merged into it. The studies also suggest that M33, the Triangulum Galaxy—the third-largest and third-brightest galaxy of the Local Group—will participate in the collision event, too. Its most likely fate is to end up orbiting the merger remnant of the Milky Way and Andromeda galaxies and finally to merge with it in an even more distant future. However, a collision with the Milky Way, before it collides with the Andromeda Galaxy, or an ejection from the Local Group cannot be ruled out. While the Andromeda Galaxy contains about 1 trillion (1012) stars and the Milky Way contains about 300 billion (3×1011), the chance of even two stars colliding is negligible because of the huge distances between the stars. For example, the nearest star to the Sun is Proxima Centauri, about 4.2 light-years (4.0×1013 km; 2.5×1013 mi) or 30 million (3×107) solar diameters away. To visualize that scale, if the Sun were a ping-pong ball, Proxima Centauri would be a pea about 1,100 km (680 mi) away, and the Milky Way would be about 30 million km (19 million mi) wide. Although stars are more common near the centers of each galaxy, the average distance between stars is still 160 billion (1.6×1011) km (100 billion mi). That is analogous to one ping-pong ball every 3.2 km (2.0 mi). Thus, it is extremely unlikely that any two stars from the merging galaxies would collide. 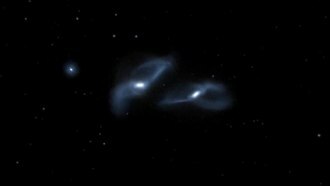 The Milky Way and Andromeda galaxies each contain a central supermassive black hole (SMBH), these being Sagittarius A* (c. 7036715878000000000♠3.6×106 M☉) and an object within the P2 concentration of Andromeda's nucleus (7038397709999999999♠1–2×108 M☉). These black holes will converge near the centre of the newly formed galaxy over a period that may take millions of years, due to a process known as dynamical friction: As the SMBHs move relative to the surrounding cloud of much less massive stars, gravitational interactions lead to a net transfer of orbital energy from the SMBHs to the stars, causing the stars to be "slingshotted" into higher-radius orbits, and the SMBHs to "sink" toward the galactic core. When the SMBHs come within one light-year of one another, they will begin to strongly emit gravitational waves that will radiate further orbital energy until they merge completely. Gas taken up by the combined black hole could create a luminous quasar or an active galactic nucleus, releasing as much energy as 100 million supernova explosions. As of 2006, simulations indicated that the Sun might be brought near the centre of the combined galaxy, potentially coming near one of the black holes before being ejected entirely out of the galaxy. Alternatively, the Sun might approach one of the black holes a bit closer and be torn apart by its gravity. Parts of the former Sun would be pulled into the black hole. Two scientists with the Harvard–Smithsonian Center for Astrophysics stated that when, and even whether, the two galaxies collide will depend on Andromeda's transverse velocity. Based on current calculations they predict a 50% chance that in a merged galaxy, the Solar System will be swept out three times farther from the galactic core than its current distance. They also predict a 12% chance that the Solar System will be ejected from the new galaxy sometime during the collision. Such an event would have no adverse effect on the system and the chances of any sort of disturbance to the Sun or planets themselves may be remote. Excluding planetary engineering, by the time the two galaxies collide the surface of the Earth will have already become far too hot for liquid water to exist, ending all terrestrial life; that is currently estimated to occur in about 3.75 billion years due to gradually increasing luminosity of the Sun (it will have risen by 35–40% above the current luminosity). When two spiral galaxies collide, the hydrogen present on their disks is compressed, producing strong star formation as can be seen on interacting systems like the Antennae Galaxies. In the case of the Andromeda–Milky Way collision, it is believed that there will be little gas remaining in the disks of both galaxies, so the mentioned starburst will be relatively weak, though it still may be enough to form a quasar. The galaxy product of the collision has been nicknamed Milkomeda or Milkdromeda. According to simulations, this object will look like a giant elliptical galaxy, but with a centre showing less stellar density than current elliptical galaxies. It is, however, possible the resulting object will be a large lenticular galaxy, depending on the amount of remaining gas in the Milky Way and Andromeda. In the far future, roughly 150 billion years from now, the remaining galaxies of the Local Group will coalesce into this object, that being the next evolutionary stage of the local group of galaxies. ^ a b Sangmo Tony Sohn; Jay Anderson; Roeland van der Marel (Jul 1, 2012). "The M31 velocity vector. I. Hubble Space Telescope proper-motion measurements". The Astrophysical Journal. 753 (1): 7. arXiv:1205.6863. Bibcode:2012ApJ...753....7S. doi:10.1088/0004-637X/753/1/7. ^ a b c Cowen, Ron (31 May 2012). "Andromeda on collision course with the Milky Way". Nature. doi:10.1038/nature.2012.10765. ^ a b c Muir, Hazel (2007-05-14). "Galactic merger to 'evict' Sun and Earth". New Scientist. Archived from the original on 20 April 2014. Retrieved 2014-10-07. ^ Loeb, Abraham; Cox, TJ. (June 2008). Astronomy. p. 28. ^ a b NASA (2012-05-31). "NASA's Hubble Shows Milky Way is Destined for Head-On Collision". NASA. Archived from the original on 1 July 2014. Retrieved 2012-10-13. ^ "Astronomers Predict Titanic Collision: Milky Way vs. Andromeda | Science Mission Directorate". science.nasa.gov. Retrieved 2018-10-13. ^ a b van der Marel, Roeland P.; Besla, Gurtina; Cox, T.J.; Sohn, Sangmo Tony; Anderson, Jay (1 July 2012). "The M31 Velocity Vector. III. Future Milky Way-M31-M33 Orbital Evolution, Merging, and Fate of the Sun". The Astrophysical Journal. 753 (9): 9. arXiv:1205.6865. Bibcode:2012ApJ...753....9V. doi:10.1088/0004-637X/753/1/9. ^ "Andromeda involved in galactic collision". MSNBC. 2007-01-29. Archived from the original on 6 June 2013. Retrieved 2014-10-07. ^ Overbye, Denis (September 16, 2015). "More Evidence for Coming Black Hole Collision". The New York Times. ^ Dubinski, John (October 2006). "The Great Milky Way-Andromeda Collision" (PDF). Sky & Telescope: 30–36. ^ Jonkler, Peter (November 6, 2013). "Unique SOS Signal from Torn Apart Star Points to Medium-Size Black Hole". Astrophysics. Radboud University. ^ a b Cain, Fraser (2007). "When Our Galaxy Smashes Into Andromeda, What Happens to the Sun?". Universe Today. Archived from the original on 17 May 2007. Retrieved 2007-05-16. ^ a b c d Cox, T. J.; Loeb, Abraham (2008). "The Collision Between The Milky Way And Andromeda". Monthly Notices of the Royal Astronomical Society. 386 (1): 461–474. arXiv:0705.1170. Bibcode:2008MNRAS.386..461C. doi:10.1111/j.1365-2966.2008.13048.x. ^ Schröder, K.-P.; Smith, R. C. (2008). "Distant future of the Sun and Earth revisited". Monthly Notices of the Royal Astronomical Society. 386 (1): 155. arXiv:0801.4031. Bibcode:2008MNRAS.386..155S. doi:10.1111/j.1365-2966.2008.13022.x. ^ Carrington, D. (2000-02-21). "Date set for desert Earth". BBC News. Archived from the original on 9 July 2014. Retrieved 2007-03-31. ^ "Milkomeda, Our Future Home". Retrieved 2015-09-27. ^ Fred C. Adams; Gregory Laughlin (1997). "A dying universe: the long-term fate and evolution of astrophysical objects". Reviews of Modern Physics. 69 (2): 337–372. arXiv:astro-ph/9701131. Bibcode:1997RvMP...69..337A. doi:10.1103/RevModPhys.69.337. Wikimedia Commons has media related to Andromeda–Milky Way collision. Merrifield, Michael. "Milky Way vs Andromeda: The ultimate head-on crash". Deep Space Videos. Brady Haran.